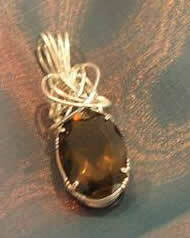 Using one of my oval or round guides the size of your gemstone will make it easier for wrapping. You'll need to use the pliers less. This is what makes nicks on the sterling silver wire. If you don’t have one of my Gem Bead Boards or Gem Boards you can use this graph to help you cut wire to the right length for your cabochon or gemstone. I have supplied you the equations below. Just find the dimensions of your cab or gemstone, and you can easily figure out the length of wire needed to wire wrap it. 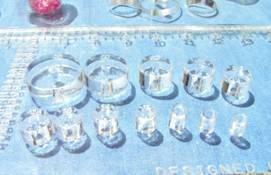 For example, my 20 x 15 mm gemstone has a perimeter of 55.54mm or 2 3/16 inches. Add 4 inches of wire for a smaller stone to 6 inches of wire for a bigger stone, this will allow extra wire for pretty work. 4” + 2 3/16” = 6 3/16” total. Prong wire = 7 3/16” total.